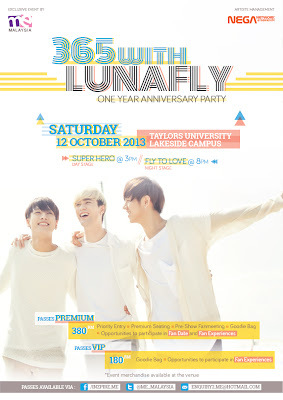 Kuala Lumpur, 2 September 2013 - After a super warm welcome from their fans in Malaysia last March, Lunafly is set to perform yet another intimate showcase on 12th October 2013 at Taylors University Lakeside Campus. Lunafly is a three-member Korean group consists of Sam, Teo, and Yun. Lunafly gained attention for their musical abilities and outstanding live performances as they often took on various street performances and music covers on YouTube, acquainting themselves with music lovers and their fans on a more personal level. The trio’s popularity is growing internationally as they have performed in Malaysia, Indonesia, Singapore, Japan, China & Tunisia. Just like before, the two-hour showcase titled ‘365 WITH LUNAFLY’ will be an intimate affairs with their fans. Audiences is in for a treat as the boys serenades and present their new songs, sprinkled with some familiar favorites at the showcase, which is also celebrating their one year debut anniversary. “365 WITH LUNAFLY” will be held on 12th October 2013 at Taylors University Lakeside Campus. There will be two shows, “Superhero” Day Stage at 3PM and “Fly To Love” Night Stage at 8PM. Premium Passes (RM380) and VIP Passes (RM180) are available in limited quantity. Special for Premium Pass holders, each session will comes with a pre-show Fanmeeting Session in which you may attend either Autograph session or Photograph session. 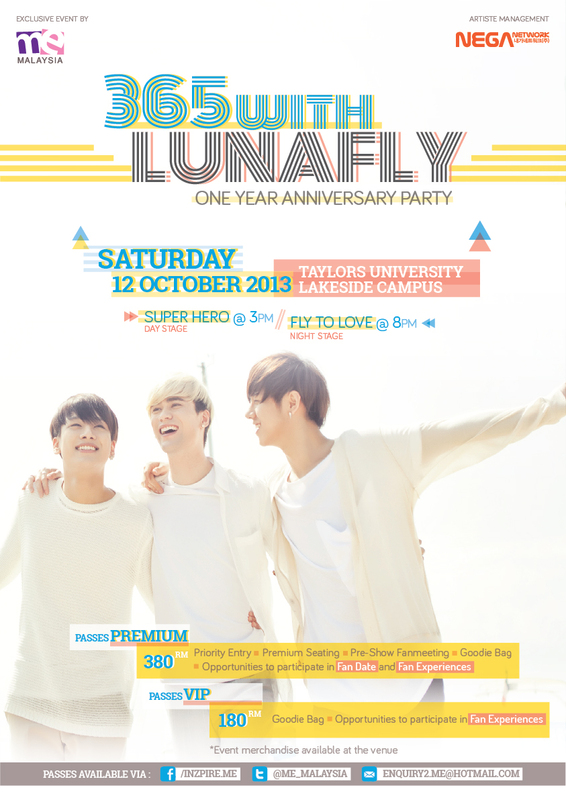 Furthermore, there will be various giveaways and opportunities to win exciting giveaways from Lunafly throughout the day.